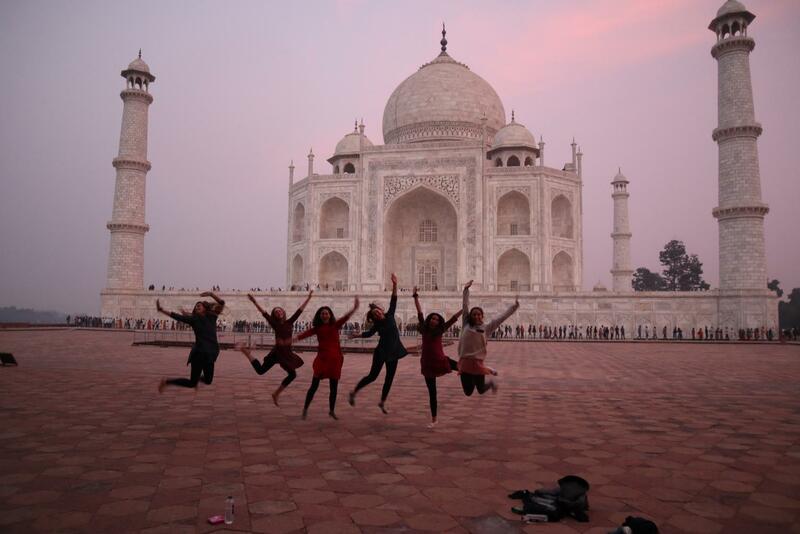 Six Archer students are captured jumping in front of the Taj Mahal at dusk. "You can even fathom [how big] the Taj Mahal is," junior Ariana Golpa said. "We were all in awe." This Thanksgiving, 13 Archer students and two faculty members swapped their turkey and stuffing for rice and dal as they traveled to India for Archer’s annual Abroad Trip. From Nov. 18 to Nov. 30, the group traveled through India with Where There Be Dragons, a company that offers cultural immersion programs for small groups of students and adults in Asia, Africa and Latin America. After a layover in Guangzhou, China, the group began their journey in Delhi. Twelve students — one student joined the trip later — and two staff advisers kicked off their experience by adventuring through the 400-year-old Chandni Chowk market and shopping for clothes at Fab India, a chain store retailing garments, furnishings, fabrics and ethnic products handmade by craftspeople across rural India. They ended their time in Delhi with a South Indian dinner and prepared for their morning flight to Jodhpur. 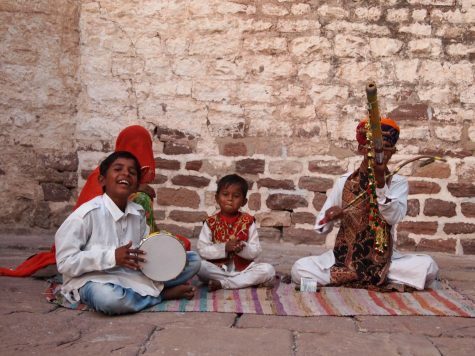 Children play traditional Indian musical instruments outside of a monument. Junior Dylan Marmur said the group wanted to make a difference where they were volunteering as much as they could, but their guides told them to adjust their attitudes. When the group arrived in Jodhpur, they began by visiting various women’s empowerment centers, such as the Sambhali Trust and Abhala Empower Center. At the shelters, local women and children are taught academics, hygiene, politics, geography, self-esteem and more. The Archer girls were able to assist the centers with administrative work and spend time with the women and children there. 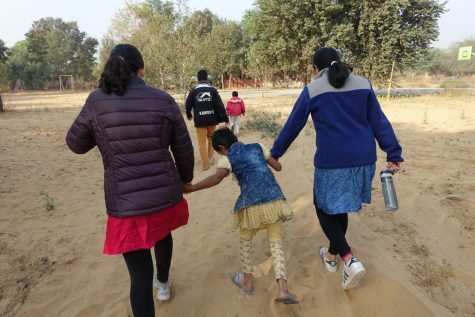 Archer students Isabella Silvers ’20 and Esha Sankhala ’20 walk with one of the children from Vatsalya. The students faced situations that they had only ever read about and experienced many new cultural norms. After spending time at the women’s empowerment centers, the group arrived at Vatsalya, a school and orphanage that Archer has partnered with for the past two years. Here, the students helped the school prepare for their annual fundraiser and learned more about Indian culture. Students said that they were able to connect with the children, regardless of cultural and language barriers. Across the world, everyday life looked very different to these Archer students and shifted their perspectives. 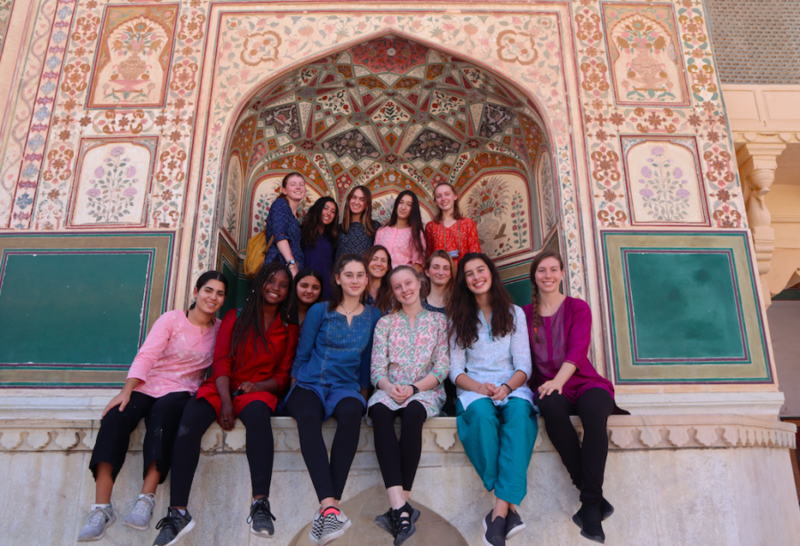 The group of 13 sophomores and juniors, along with the advisers, pose for a photo at the Amber Palace in Jaipur. The group spent two weeks traveling in India.